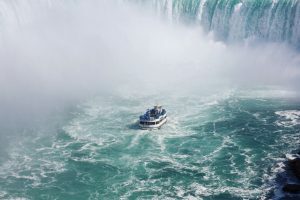 Hornblower (formerly Maid of the Mist) – Group 92 Mechanical Inc. Description: Hornblower Niagara Cruises (formerly Maid of the Mist) is an iconic tourist attraction at Niagara Falls. 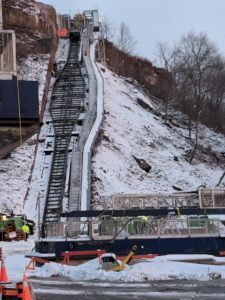 While certainly not the largest project completed by Group 92, the supply and installation of mechanical services from atop the Niagara gorge down the side of the gorge wall to the Hornblower loading area was definitely one of the more interesting projects. High pressure natural gas piping were connected at the street level and run along the Hornblower’s funicular railway to the base. Group 92 had to work with both the TSSA and Enbridge Gas to install this one-of-a-kind gas pipe system. The work also involved a new Flyte Sanitary pump chamber and lift, as well as custom made access panels. 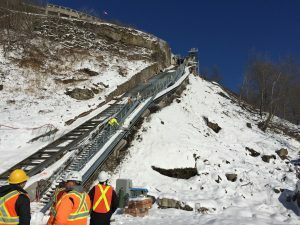 Working under winter conditions made the already complex project scope even more difficult, but that made its successful completion all the more rewarding.